The Orchard Training Area comprises 138,051 acres of land that has been used by the Idaho Army National Guard (IDARNG) since 1953. It is situated in an unpopulated area in the central portion of the western Snake River Plain and the Mountain Home Plateau, approximately 13 miles south of Gowen Field, and 14 miles south of the City of Boise. The Orchard Training Area is located within the Snake River Birds of Prey National Conservation Area. The Orchard Training Area is a major training site for the IDARNG and serves as an annual training site (ATS). The mission of the Orchard Training Area is to provide an established facility for use by any reserve component or active unit for specified periods of training. ARNG units in Idaho, as well as units from Nevada, Montana, Oregon, and Washington, regularly use the facility. The primary access to the training range and maneuver area from the north is via Pleasant Valley Road. A tank trail parallels this road and is used by track vehicles to travel to and from Gowen Field, which houses the administrative and range control operations supporting the Orchard Training Area. Interstate 84 provides additional access to the range, passing through the townsite of Orchard just northeast of the training area. The primary structures located at the Orchard Training Area are range towers and control facilities, a helicopter pad, medical evacuation building, training facility, barracks, and maintenance buildings. A mobilization and training equipment site (MATES) facility is located adjacent to the training area's northeast boundary. In addition, an ammunition supply point (ASP) is situated within the training area boundary in close proximity to the MATES. The Orchard Training Area is divided into two areas: the Impact Area and the Maneuver Area. The Impact Area is used as a target zone for live ammunition and artillery firing. Units conduct tank-mounted artillery firing from sites established around the periphery of the Impact Area. The Impact Area is off-limits to the public to ensure safety from unexploded ordnance. The Maneuver Area provides a location for tank and other vehicle maneuvers and also supports artillery firing. The Orchard Training Area has 16 designated ranges for tank and helicopter gunnery, field artillery and mortar unit firing, rifle and small arms firing, and grenade launching. These ranges comprise a central impact area of approximately 65,300 acres. 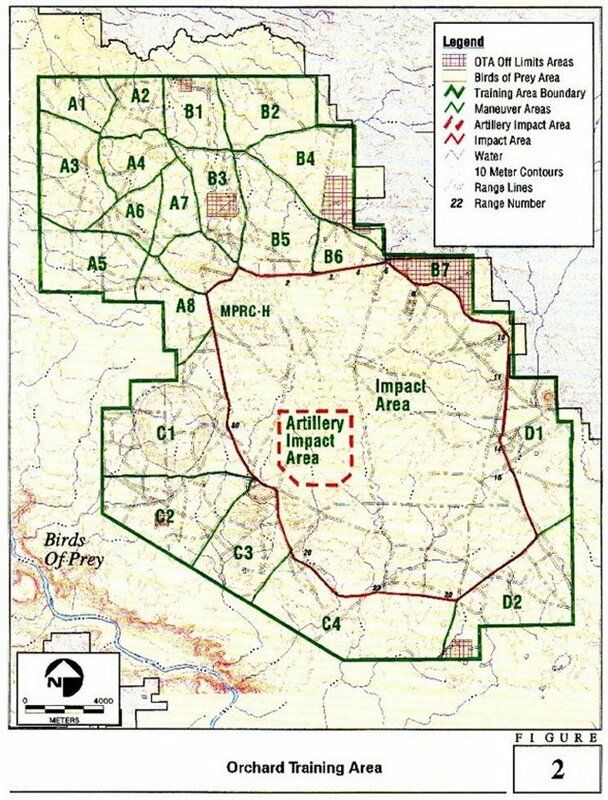 This impact area is sufficiently large to permit training with field artillery and mortar units, at maximum range from the perimeter, without conflicting with other training activities in the perimeter. Day and night firing are practiced. There are also ten maneuver areas at the training site located around the perimeter of the firing range. These areas serve as bivouac sites for units during training exercises. The Maneuver Area at the Orchard Training Area totals 72,750 acres. Approximately 70 miles of improved cinder and dirt roadway provides circulation within the training area. The terrain is predominantly flat desert land with several scattered buttes. Elevations range from approximately 3,000 feet to 3,300 feet. The highest point in the Orchard Training Area is Big Foot Butte, rising to 3,535 feet. Christmas Mountain Butte is the next highest point, with an elevation of 3,497 feet. Surface soils in the Orchard Training Area are an alkali clay with a high density of lava rock outcroppings. Little rainfall occurs in the area after mid-June and throughout the summer months. The topography of the area consists of rolling terrain with numerous draws, dry streambeds, and rocky knolls. A portion of the land is covered with two- to three-foot high sagebrush and patches of desert grass. There are no other structures in the area, with exception of the observation towers and facilities developed for training purposes. To facilitate adequate range control, an underground cable from Cinder Cone Butte to each of the main tank and artillery observation posts has been constructed. In addition, a radio-equipped cinder block building is located on Cinder Cone Butte, which provides direct communication with Mountain Home Air Force Base and Post Headquarters at Gowen Field. 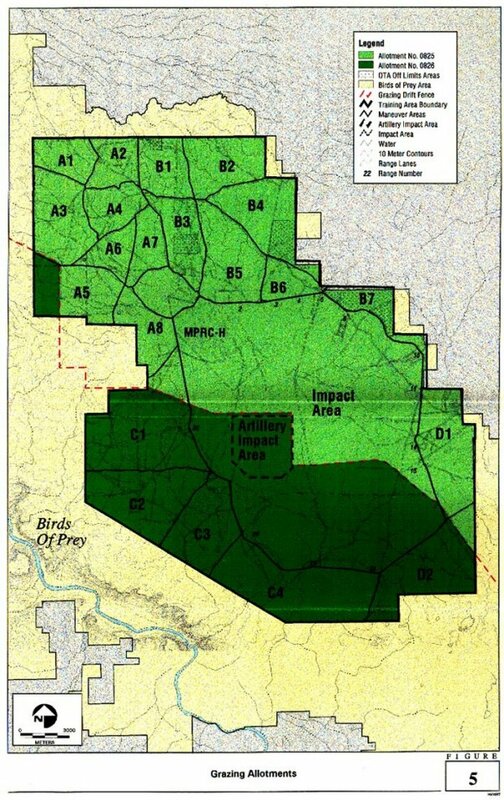 Airspace associated with the Orchard Training Area consists of Restricted Areas 3203A, B, and C. There are no military operation areas (MOAs) associated with these restricted areas. The IDARNG currently utilizes both the Orchard Training Area and the restricted airspace overlying the majority of the training area. The National Guard uses the OTA primarily for armored vehicle training including firing of live ammunition, firing of lasers, tank maneuvering, bivouacking, helicopter maneuvering and firing, and small arms firing. 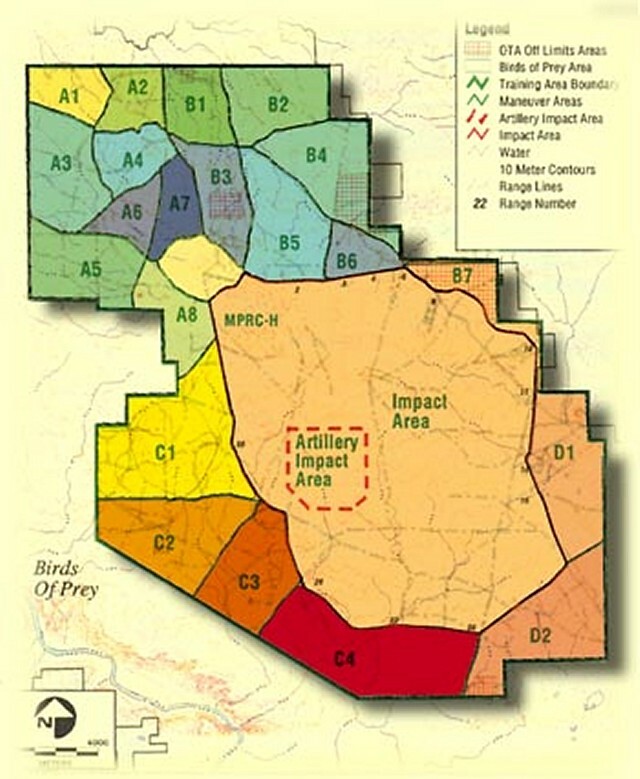 Most firing of live ammunition occurs from firing ranges (cinder rock pads from which tanks are fired) permanently located just inside the Range Road that encompasses the impact area; all training rounds are fired from the ranges into the impact area. Artillery is fired from areas outside of Range Road, but is aimed towards the Artillery Impact Area within Range Road. Maneuvering and bivouacking occur primarily outside or immediately inside Range Road. Assembly areas (where tents and/or fueling occur) are temporarily located outside the impact area as needed. During the summer months, the OTA serves as the Annual Training Site for the Idaho, Montana, and Oregon Army National Guard units that constitute the 116th CAV BDE, as well as other units from around the country. During the winter, most activity is concentrated in the northern portions of the OTA, where year-round schools are conducted by the Combat Vehicle Transition Training Team for National Guard Units from all over the country. Military training began in the vicinity of the Orchard Training Area (OTA) in 1941, during World War II, when three 1,036-ha practice bombing ranges were established. In 1943, a 5,666-ha air-to-ground gunnery range was added. These ranges were mostly west of the current OTA, and were closed in 1948. The Idaho Army National Guard (IDARNG) obtained permission to establish the training area in 1953, following negotiation involving the Idaho Congressional delegation, the Department of the Army, and the Department of the Interior (USDOI). In the ensuing years, the U.S. Army Corps of Engineers and the U.S. Marine Corps also were given permission to train within the boundaries of the OTA. Substantial improvements in the form of roads, mechanized targets, and tank training lanes have been made by the IDARNG. Training is authorized until the year 2015 under the existing Memorandum of Understanding with the USDOI Bureau of Land Management (BLM). The Snake River Birds of Prey Natural Area was established in 1971 by Public Land Order 5133 to protect one of the largest known nesting concentrations of raptors in the world. 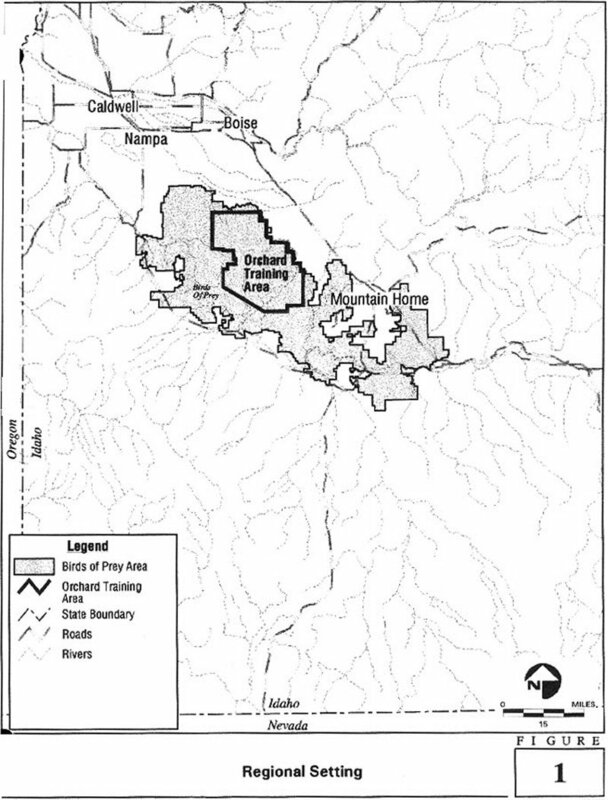 This order withdrew 10,811 ha of public land in and adjoining the Snake River Canyon. 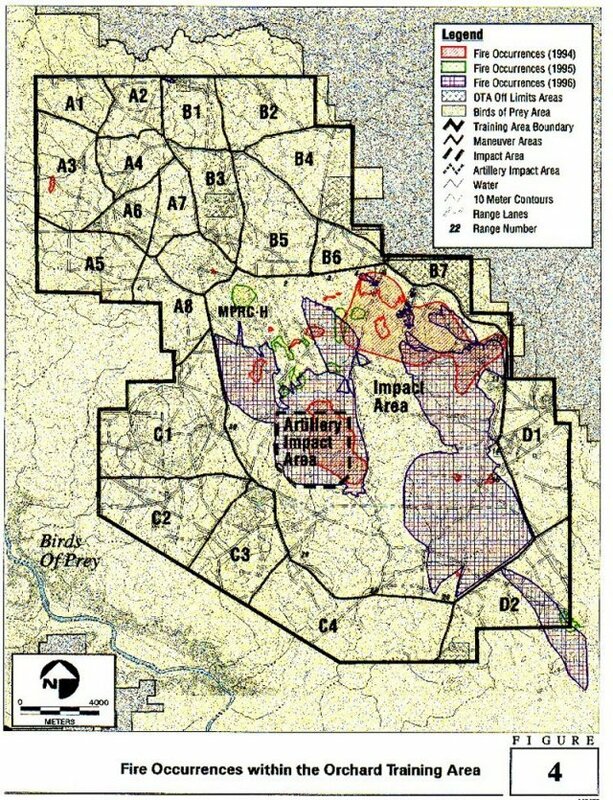 The boundaries of the OTA were adjusted to eliminate training near the more delicate and higher-use raptor habitats closest to the canyon. When the Secretary of the Interior established the Snake River Birds of Prey Area by withdrawal of 195,463 ha of public land (Public Land Order 5777) in 1980, the withdrawal included all of the OTA. Military training activities were specifically authorized to continue by that order. National Guard units from three states spend about 10 days a year training at Idaho's Orchard Training Area. They devote part of their training at this 138,000-acre site in the Boise Valley to environmental awareness and care of the unique plants, animals and soils found there. This training combines scientific knowledge with training management and helps soldiers comply with federal, state and local environmental laws. The Idaho Army National Guard protects its training land with the aid of an Army program known as Integrated Training Area Management (ITAM). The Guard's natural resources management staff monitors the conditions of desert plants and animals that inhabit the Idaho training area. The ITAM program also collects similar information from other installations to help determine the conditions on Army lands. The Idaho Guard's Natural Resources Branch is regarded for its work in Land Condition Trend Analysis (LCTA), comprehensive environmental awareness training, environmental mapping and analysis with Geographic Information System (GIS) tools, and revegetation of native plants through Land Rehabilitation and Maintenance (LRAM). In 1992, the organization became the first National Guard group to win the Secretary of the Army's Natural Resources Conservation Award. Most recently, the team won a coveted spot on the Renew America Environmental Success Index. The Idaho Guard's natural resources staff also participates in environmental research projects, such as a "soil crust" study with Boise State University. A grant from the Department of Defense helps biologists learn more about preventing wind erosion in and around the training area. With the U.S. Forest Service Inter Mountain Research Lab, the Idaho Guard's natural resources staff is collecting information about two unique species of wildflowers found at the Orchard Training Area. Until more is known about these flowers, their habitat is "off limits" to training vehicles. Through its Environmental Awareness Program, the Idaho Guard develops materials that communicate environmental concerns to troops and commanders who train at Orchard. Videos, posters, pocket cards, handbooks, slide shows and computer sessions explain how to care for the sensitive natural resources at the training area. Each unit that trains there receives a briefing on environmental issues unique to the Orchard Training Area. Another special feature of the training area is the Snake River Birds of Prey National Conservation Area. This refuge for golden eagles, falcons, hawks, owls and other raptors runs for 81 miles along the Snake River. The Snake River Canyon is also a natural resource responsibility for the training area because plants there provide food and habitat for the birds' prey.